On Tuesday, ICC in partnership with UNICEF announced #OneDay4Children, a tournament-wide campaign focussed on bringing the world of cricket together as one team to help build a better world for every child. 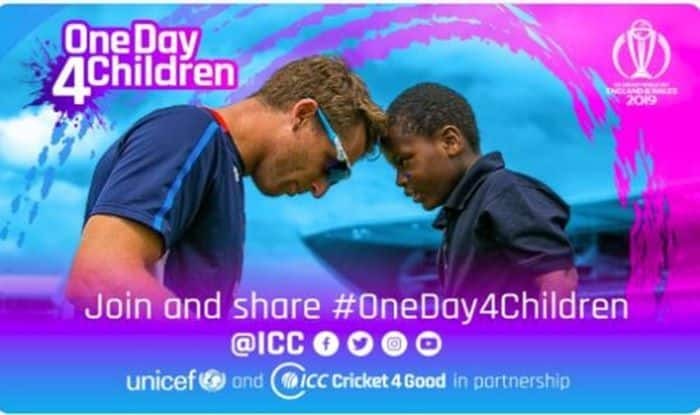 International Cricket Council (ICC) Cricket for Good on Tuesday in partnership with UNICEF announced #OneDay4Children, a tournament-wide campaign focussed on bringing the world of cricket together as one team to help build a better world for every child, at the World Cup. Former England batsman and #OneDay4Children ambassador Nasser Hussain along with all-rounder Chris Woakes launched the campaign. There will be #OneDay4Children activity throughout all 48 matches of the event, peaking with a day of celebration during the match between England and India on June 30 at Edgbaston. The money raised will support UNICEF’s work in cricket playing nations to help children learn to play and be healthy. Edgbaston will turn blue whilst players will support the campaign with special one-off #OD4C branded kit, ICC reported. “We are delighted to see the world of cricket unite for #OneDay4Children at the ICC Cricket World Cup 2019. Players, teams and one billion cricket fans will come together for Unicef. The money raised through #OneDay4Children will support Unicef’s work to help children learn, play and be healthy through cricket. It is a shared belief that cricket has an incredible power to raise vital funds and inspire and empower millions of children,” Mike Penrose, Executive Director at Unicef UK, said. The much-awaited World Cup is scheduled to be hosted in England from May 30 to July 14.